The secret to making eggplant in 15 minutes is to skip the whole breading and frying step and use cooked eggplant from the deli. My preference would be for eggplant slices from the deli but unfortunately my deli had run out so I had to make do with eggplant in a jar. A little bit oilier but still delicious. For those that still need a bready fix, sprinkle the parmigiana with breadcrumbs before topping with the cheese and parmesan. 1. eggplant. Preheat your overhead grill (broiler) on its highest setting and place a medium fry pan on a high heat. 2. Add a generous glug of olive oil and the tomatoes to the fry pan. Simmer for about 7 minutes. 3. Meanwhile, if the eggplant has been packed in oil, drain on paper towel. 4. Add eggplant to the tomato and push in to cover with the sauce. Scatter over the bocconcini and grate parmesan over the top. 5. Place under the hot grill for 4-5 minutes or until the cheese is golden and bubbling. 6. salad: Meanwhile, combine balsamic and 1 tablespoon olive oil in a small bowl. Season. 7. Sit leaves on top of the dressing and toss at the table. The eggplant can be made ahead and reheated in the oven or under the grill. Salad on the other hand is best made fresh. vegan / dairy-free– skip the cheese and replace with a couple of really generous handfuls of bread crumbs, preferably made from rustic sourdough. carnivore – layer over a few slices of proscuitto or salami either before adding the cheese or just before serving OR brown some minced (ground) beef and add to the tomato sauce. more substantial (low carb) – extra veg. Shaved parmesan. fresh eggplant – will take much longer than 15 minutes. But slice 1 large eggplant into 1cm (1/2in) slices and layer on a baking tray. Drizzle generously with olive oil and bake for 30-45 minutes or until soft and starting to brown. Then use as per the recipe. no bocconcini? – just increase the amount of parmesan or use another good melting cheese like mozzarella, gruyere or even cheddar. carb lovers / more substantial – serve with cooked buttered pasta, or make sandwiches. paleo (Grain, legume & dairy-free) – replace bocconcini with grilled zucchini and replace parmesan with sliced almonds. grilled eggplant from the deli – in a jar will keep unopened in the pantry. Otherwise will keep in the fridge for a few weeks. Can be frozen. bocconcini balls – freeze them. parmesan cheese – will keep wrapped in a plastic bag in the fridge for months. basil leaves – cover with olive oil to make a basil oil and store in the fridge. Or use to make pesto. Or freeze them. salad leaves – use for another meal or freeze them. Will wilt when defrosted. bland – remember to season generously. 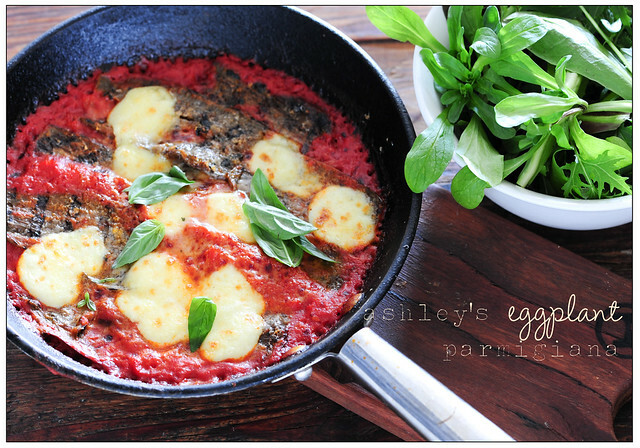 too watery – next time simmer for longer to concentrate the tomato before adding the egplant slices. cheese rubbery – you need fresh mozzarella for this. Make sure your cheese is of good quality. Lovely as is with a little extra parmesan served at the table. You could also toss the hot, cheesy eggplant into cooked pasta. Or serve with crusty bread for soaking up the sauce.